From Workers’ International News, Vol.6 No.10, November-December 1946. Proofread by Scott Wilson in 2006. The present epoch is the epoch of definite capitalist decline. The general crisis of capitalism is reflected in the contradiction between the development of the productive forces and the private ownership of the means of production and the rational state. Capitalism fulfilled its historic function, the development of the national state and the creation of the world market in the decades prior to the first world war. Capitalism can no longer serve for the development of the forces of production. Despite the immense increase in the productivity of labour and the continued development or technique, production on a world scale finds itself hampered and restricted by the fetters of private ownership of the means of production, transport and exchange, and the national slate. Already by 1850-1870, the basic historical role of capitalism had been fulfilled. It had, even at that stage, become a fetter on the development of the productive forces. That is the explanation for the error in perspective of Marx and Engels in believing that the victory of the proletarian revolution was imminent. However, through the development of the world market, which gave it new resources, capitalism revealed itself not yet as an absolute, but as a relative, fetter on the development of the forces of production at this stage. Marx pointed out that no society would give way to a new society until all the productive possibilities within it had been completely exhausted. Between 1870 and 1914 capitalism revealed itself as an ascending economy. Of course, had the proletariat come to power (the productive forces had already been sufficiently developed for this) the expansion of the productive forces would have been immeasurably greater. Nevertheless, capitalism could succeed in maintaining itself because it still remained a relatively progressive factor. The first world war marked a definitive change in the role of capitalism. The world had been divided into spheres of influence, markets, sources of raw materials and could only be re-divided by bloody imperialist war. The epoch of capitalist decay and of capitalism’s death agony was ushered in. This it was that presaged the period of wars, revolutions, uprisings and convulsions, which was clear evidence of the insoluble impasse into which the capitalist system had landed humanity. The general crisis of capitalism was reflected in the fact that the productive forces had ceased to grow with the same rhythm as in the past. Thus, in the downswing of capitalism it can be seen that production tends to oscillate around the level of 1919-37. Without being enabled to gain the steady rhythm of increase in the decades prior to the first world war, when each crisis was succeeded by an enormous upswing on a higher level of the productive forces. World War II, a further proof of the death agony of capitalism, has resulted in the frightful destruction of men, of the productive forces, in the disorganisation and disintegration of production in Europe and Asia, such as has never been exampled in history. Imperialism and capitalism have thus shown the barbarism into which their continued existence will plunge mankind. In opposition to the reformists and Stalinists, who seek to lull the masses with a perspective of a new renaissance of capitalism and a great future for democracy, the resolution of the International Pre-Conference is one hundred per cent correct in emphasizing the epoch of decline and collapse of world capitalist economy. But in a resolution that seeks to orientate our own cadres on immediate economic perspectives – from which the next stage of the class struggle will largely flow, and thus our immediate propaganda and tactics – the perspective is clearly false. The present crisis and low level of production, is not the economic crisis as understood by Marxists in the classic sense. It is a crisis of “underproduction” arising from imperialist concentration of productive forces for war and from war destruction itself. It reflects itself in the lack of capital goods, lack of consumers’ goods, and lack of agricultural goods. Just the opposite of an economic crisis of capitalist overproduction as understood by Marxists. The frightful famines which have stricken the peoples of the entire world, the disorganisation and decay of Europe, are indications of the disruption of the capitalist system. These could easily have led to the destruction of capitalism and the organisation of socialist production on an all-European and all-Asiatic scale, were it not for the weakness of the revolutionary party and the capitulation of the mass organisations of the working class. For the second time in a generation capitalism has been enabled to gain a new breathing space. The theory of spontaneous collapse of capitalism is entirely alien to the conceptions of Bolshevism. Lenin and Trotsky emphasized again and again that capitalism will always find a way out if it is not destroyed by the conscious intervention of the revolutionary party which, at the head of the masses, takes advantage of the difficulties and crises of capitalism to overthrow it. The experience of World War II emphasizes the profound correctness of these conceptions of Lenin and Trotsky. No matter how devastating the slump, if the workers fail, capitalism will always find a way out of its economic impasse at the cost of the toilers and the preparation of new contradictions. The world crisis of the capitalist system does not end the economic cycle but gives it a different character. The theory of the Stalinists put forward in the last world crisis that this was the last crisis of capitalism from which it would never recover, has been revealed to have been entirely unMarxian. There is a grave danger that this theory will be revived in our own ranks today. If the Stalinist parties had been genuine revolutionary parties, the capitalist class would now be faced with an entirely different perspective in economy as well as politically. The proletariat in France would have paralyzed the attempt of the capitalists to restore production at the expense of further sacrifices and burdens on the part of the masses. But the two traitor organisations of the proletariat are straining every nerve to prevent, frustrate and sabotage any struggle, economic and political on the part of the proletariat. If a conflict develops between Stalin and Western European capitalism and the Stalinist organizations are used to disrupt and force concessions by means of mass strikes, the situation can deteriorate for the capitalists overnight. Even the assistance of American finance would not and could not prevent the crisis that would follow. However, apart from these political considerations, there are the laws of capitalism which themselves ensure the upswing of economy and make a new “boom” inevitable. Particularly in view of the fact that this crisis is not a crisis of overproduction and that the capitalists are not being attacked in Western Europe by the mass organisations, but receive the direct assistance and support of Social Democracy and Stalinism, a cyclical upswing is inevitable. It is not excluded that particularly for Western Europe (with the exception of Germany and Austria) the productive figures can even reach and surpass the pre-war level in the next period. Even in Germany, depending upon the relationship between the imperialists and Russia, a greater or lesser revival will take place, though here because of the conflict between the powers and the division and occupation of Germany, it is impossible that pre-war figures will be reached in the next period. All the factors on a European and world scale indicate that the economic activity in Western Europe in the next period is not one of “stagnation and slump” but one of revival and boom. The main feature of capitalist crisis (“stagnation and slump”) as revealed for example by the classic crisis of 1929-33 which assumed unexampled scope and severity on a world scale, was overproduction of capital goods, consumers goods and agricultural produce. The industrial crisis was thus supplemented with a simultaneous agrarian crisis. The economic revival which followed the last world slump, as always, was achieved by the destruction and deterioration of capital goods, the deterioration and destruction of consumers’ stocks, the cutting down of the areas sown with crops, etc. Though this involved immeasurable misery and suffering for the toilers, nevertheless, particularly with war preparations, by 1937-38 the production figures exceeded even the record years of 1928-29 in most countries of the world. The destruction wrought by the war has achieved similar results to those which the capitalists achieve when they consciously set out to destroy wealth in a period of crises of overproduction. The classic conditions for boom are present in Europe today. A shortage of capital goods; shortage of agricultural produce; shortage of consumers’ goods. The shortages impose new miseries for the masses and new strains on the system. These conditions engendered by willful destruction and the normal processes of decay of capitalist slump are here produced by the devastation and havoc of totalitarian war. This devastation did not lead to the overthrow of the system through the victory of the proletariat. In the same way as recovery follows a slump which does not lead to the overthrow of the system, so the restoration of the productive forces will follow the present chaos, even on a capitalist basis. However, such a recovery, as already stated in the citation from Trotsky, cannot lead to a blossoming of the economy of capitalism. A new recovery can only prepare the way for an even greater slump and economic crises than in the past. The argument of the comrades of the American SWP, which has been echoed by the Minority of the British Party, that only after the proletariat has been decisively defeated would American imperialism give loans to assist the recovery of Western European capitalism, has already been demonstrated to be a false one. The proletariat has not been defeated, but loans have already been given. Equally false is the argument that only if the proletariat is decisively defeated can economic recovery and revival take place. Such an argument lumps together political-economic problems visualising an immediate reflection of one upon the other. Undoubtedly, a decisive defeat of the proletariat gives the bourgeoisie stability and confidence. But unless the economic preconditions for a boom are present, a boom would not necessarily follow even in that event. It is not a law of the development of capitalism that only the defeat of the proletariat in a revolutionary situation can lead to a boom, any more than a slump automatically leads to a revolution. History teaches us that capitalism, even in its death agony, recovers after a slump, despite the revolutionary possibilities, if the proletariat is paralyzed or weakened by its organizations and rendered incapable of taking advantage of its opportunities. After the revolutionary wave of World War I had been stemmed by Social Democracy, capitalism was enabled to revive at the expense of the intensified exploitation of the working class. The first post-war revolutionary wave of World War II has been stemmed and paralyzed by Social Democracy and Stalinism. Economic revival is taking place before our eyes in most countries of Western Europe and Britain. Not only this. The bourgeois state machine in the Western countries, which had been disrupted and shattered after the fall of Hitler, has gradually been rebuilt on the basis of bourgeois democracy. A precarious “stabilization” of the bourgeois state and the restoration of the economy from the position of almost complete disruption and chaos has taken place. The rhythm of recovery is proceeding at a fairly rapid pace in all of Western Europe, apart from Germany. The paralysis of the proletariat, through its organisations, has allowed the bourgeois the opportunity to recover control of its economy. It does not follow from this that the proletariat is defeated. In reality, ebbs and flows of the workers’ movement, together with ebbs and flows in the economy will take place, and not necessarily in direct dependence one upon the other. Economic recovery is not necessarily dependent upon a definitive defeat of the proletariat: revolution is not necessarily dependent upon economic decline. Economic revival is not necessarily a debit for the revolution. On the contrary, with the paralysis of the proletariat, the harnessing and knitting together of the masses in industry will strengthen their confidence and fighting capacity. It can prepare the way for big struggles (America 1936) which can pose again the political questions in a clear and sharp fashion. The economic revival, in any event, can last only a few years and the new slump again pose before the workers the treachery of the Stalinist and Social Democratic leaders who shouted “Production” ... and produced unemployment and want because of “overproduction.” While the proletariat can be lulled and reconciled by its organizations in a period of universal shortage, to accept the yoke of increased slavery and the burdens of increasing production, they will find it intolerable when they see the impasse into which these sacrifices have led them. But only if the Fourth Internationalists have carefully explained the process in a theoretical fashion, can we reap the benefits from the advanced section of the working class. Only on that basis will it be possible to talk of leadership of the masses. The first world war was followed by a boom, not by a slump, in accordance with the laws of capitalist economy. Immediately following the war, the overall production index for the whole of Europe excluding the USSR, stood at 62 per cent of the 1913 figures. Production during 1919 and 1920 rose steadily to 79 per cent of the pre-war figure at the end of 1920, the average indices for 1919 and 1920 being 66 per cent and 74 per cent respectively of the 1913 figure. The following figures of the basic commodities production in the main countries and graphs of French coal and steel production give an indication of the fairly rapid tempo of recovery in Western Europe, despite the existence of mass Communist Parties and the strivings of the young Soviet Republic under Lenin and Trotsky to extend the socialist revolution. * in thousands of metric tons. 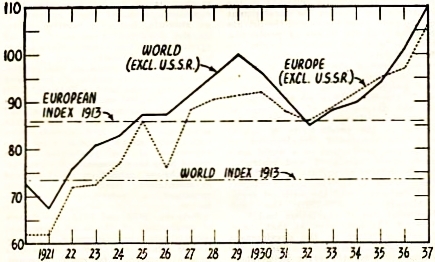 It is important to note that after the short slump of 1921, during which year the economic recovery was further hampered by the bitter class struggles, the economy of Europe and the world rose steadily (apart from slight set-backs) right up until 1929. (see graph 1). Theoretical understanding would postulate that given the tremendous destruction of capital goods in the course of the war, and the dearth of consumer goods that resulted from six years of depreciation, the inevitable result will be a post-war boom. When we add to these economic factors the political relations which resulted in the paralysis of the proletariat by Social Democracy and Stalinism, and the weakness of the Fourth International, it is clear that the economic recovery will parallel, if not exceed that of the past post-war period. This theoretical postulate has been conclusively proved in that the level of industrial production in France has risen from 33 per cent in August 1945 (see Economist August 8th 1945) to 60 per cent in March 1946 (see Economist, March 23rd 1946) to 80 per cent in June 1946 (see Economist June 28th 1946). A comparison of the tempo of recovery of industrial activity of the two post-war periods is now partially possible. 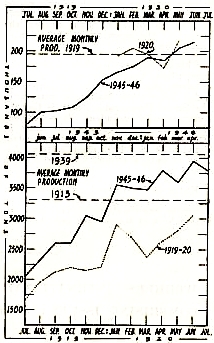 The following graphs, showing the average monthly output of coal, and pig iron in the two post-war periods give an indication of the relative tempo of industrial recovery. All statistics (unless otherwise mentioned) are official League of Nations figures. 1. Owing to exceptional conditions produced by the war, German production virtually collapsed and American production soared to record heights.